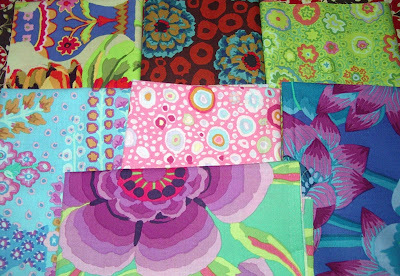 My love (obsession) with fabric started when I was very young and mom/Freda would drag me around fabric stores looking for fabric deals. Since Freda made everything fabric related from clothes to quilts and slipcovers, and she was on a very tight budget, she was always searching for a deal. It is hard to pass up a fabric deal and there are so many sales going around right now (both locally and online) that I succumbed to a little fabric purchase here and there. I limited myself to a half yard each and felt pretty good about that. 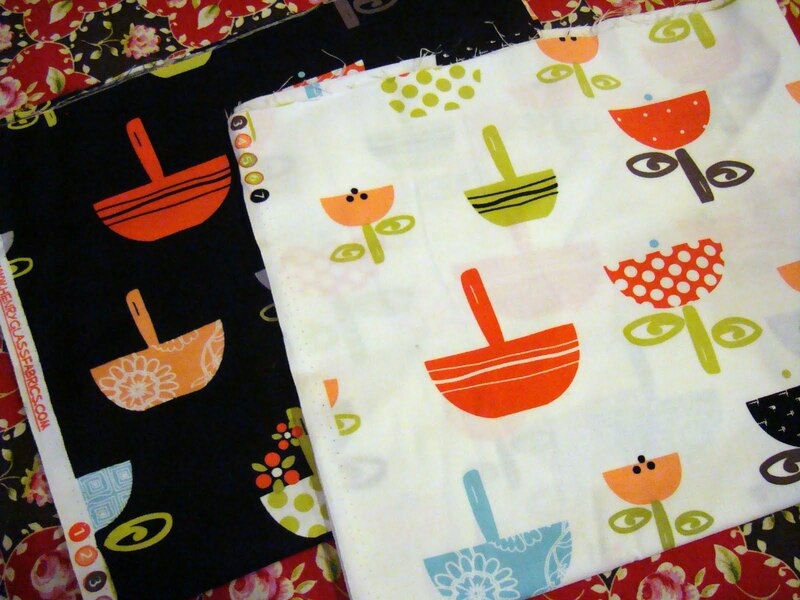 These fabrics may not look exactly like my style but I couldn't pass them up. And they look great together. These look more like me and in half yard cuts I'm very happy with them. More and more like my style these fabrics came home with me. I couldn't decide on black or neutral for this print so I picked both. 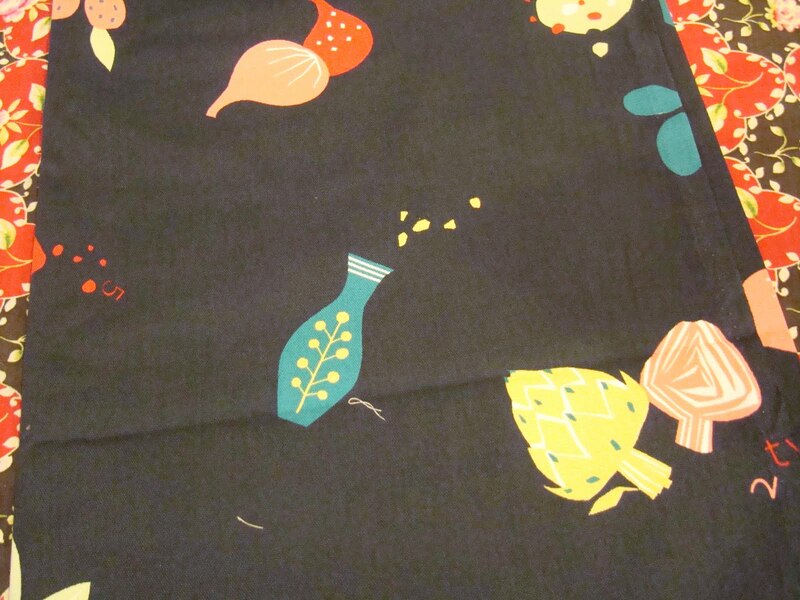 Another cute print in 1/2 yard. This truly is "me". I love fabric with words. 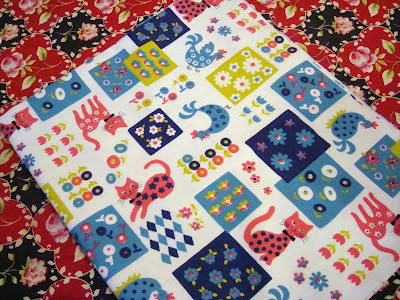 This home dec weight fabric I'm really not sure what to do with but I really like it. Cats and chickens - they both live at my house so this is perfect for me. I know it is hard to shop after Christmas when the cash is gone after gift shopping but I didn't spend too much and I like what I brought home. We have a blizzard here in Utah County. We finally got our "snowpocalypse" or something like it. Happy New Year everyone. Next week I'll show more lovely Christmas gifts. I need to start sewing now. It always seems like I'm bragging when I bring out gifts to show but really I can't stop myself. Forgive me. It really is easier to give but it is fun to get stuff, isn't it. And besides, we should all be taking note of the winners for our Christmas list for next year when we are wondering what to give. My sister Teri had these hive charms made for us. They really are amazing. I love them. So perfect for everyone in the Freda's Hive Collective. Books are always winners, aren't they. I absolutely love Ina and love vintage notions. Both books are perfect gifts. I'm a Jim Shore fan and my little collection added 2 more sweet figures this Christmas. They are both from Polly, sweet Polly. 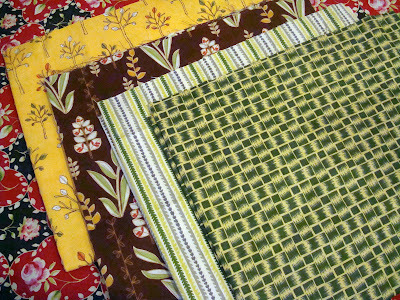 One is quilting themed and one is for my birthday month. Love them. I really love Bath and Body products. These smell amazing. I got a big gift pack from Michelle but only a few are there to show. I've already started using most of them so they are up in my room or by my chair in the family room. A perfect gift for me, too. Mr. Hive bought me these gloves (thanks for shopping and picking Shelbie). They are red (of course) and they will keep me toasty when I've got my iphone going in the cold. Not when I'm driving, of course. This really cute calendar is from Shelbie. It is the perfect size for me to use for "at a glance" planning. 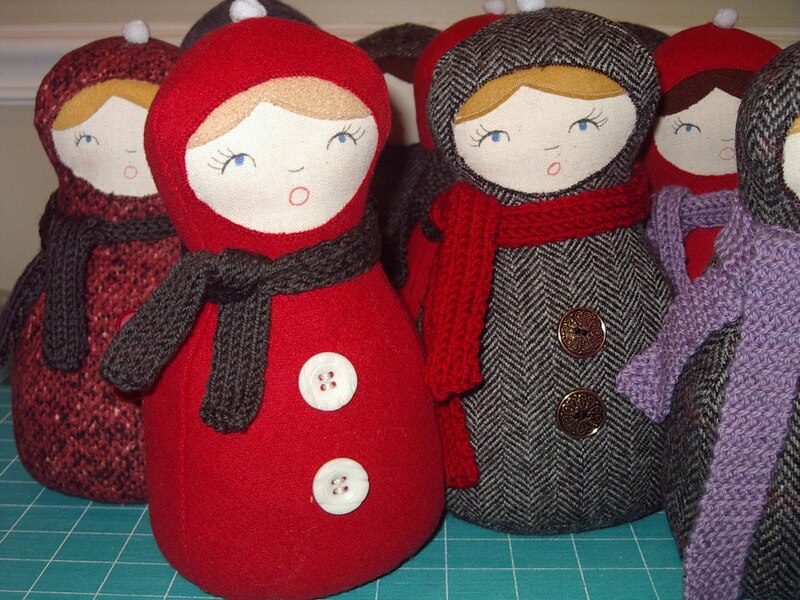 Really sweet for a matryoshka lover like me. This fun collection is from Justin and Natalie. It is so funny how everyone hit the perfect mark on gifts. The tape is like wonderful fabric I can stick to things. 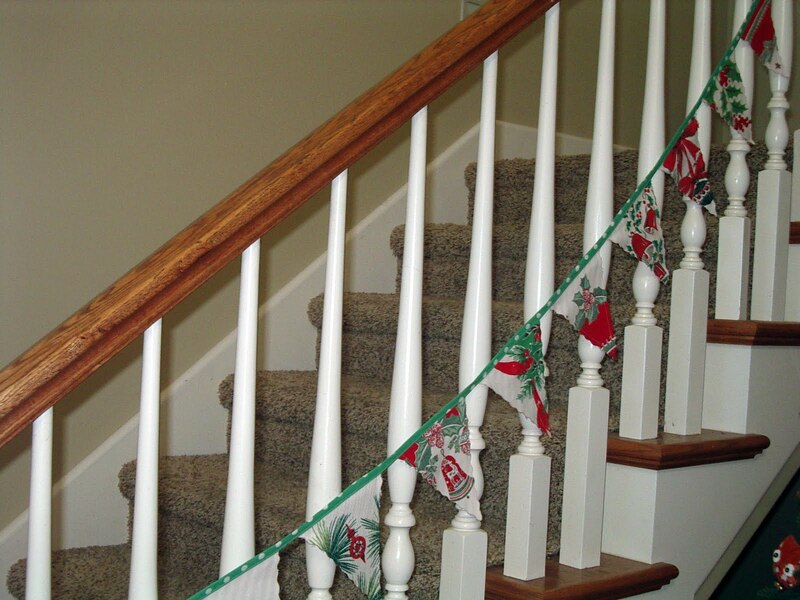 The trim is French and rich and beautiful. 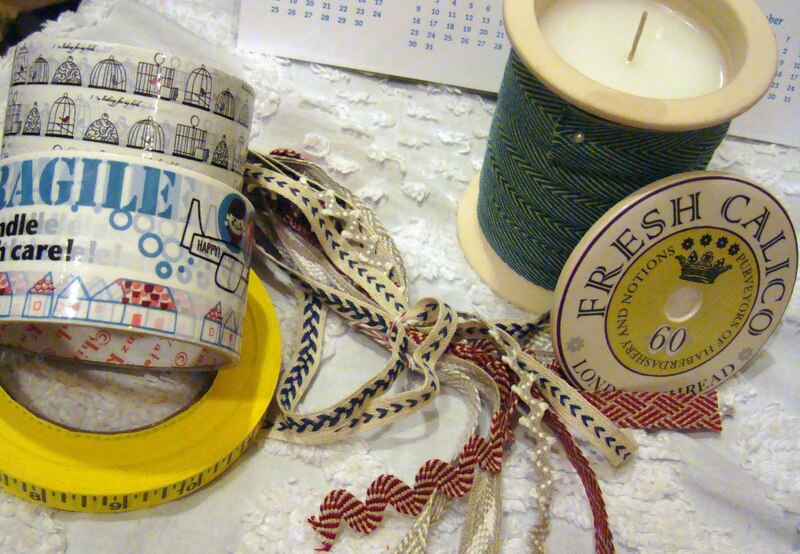 Notice the big spool is a candle as well. And it smells clean and fresh like the Bath and Body products. So when I'm done burning it I can wrap more trim around it. How's that for recycling?! I have so many more lovely things to show you in the next week. But I have to pace myself to give the full effect. Christmas Eve I made Allison a little dress in this cute owl fabric. It looks kind of strange sitting on my ironing board. Here she is trying it on. It works great for cold weather with a long sleeved onsie under it. She can wear it with leggings. My daughter is with her in-laws in Hawaii right now so I hope Allison is wearing it there with sandals. I'm super jealous! 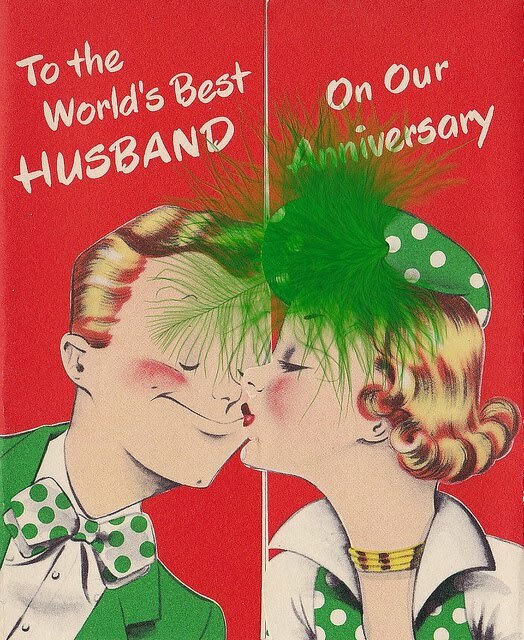 Today is Mr. Hive and my 31st wedding anniversary. We are off spending the day together. 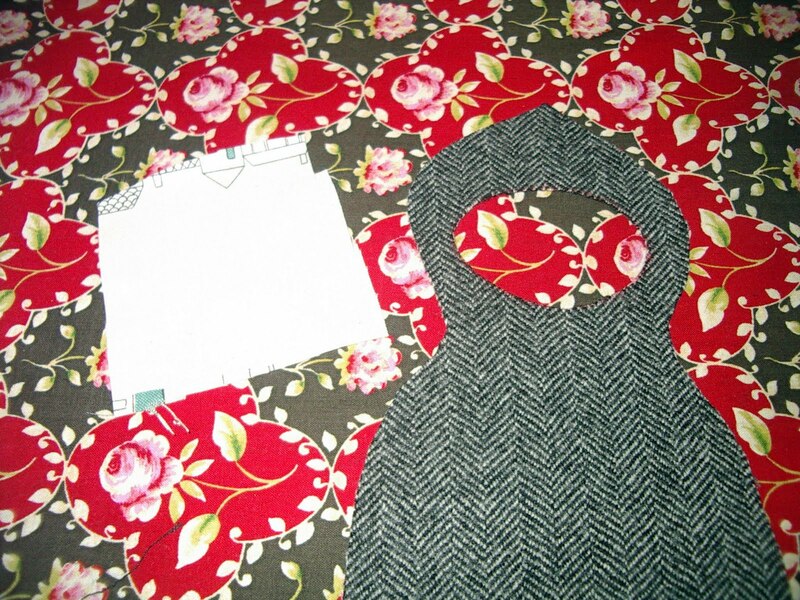 I hope that I can get back to reading blogs and visiting more regularly and do some sewing by next week. It's over. 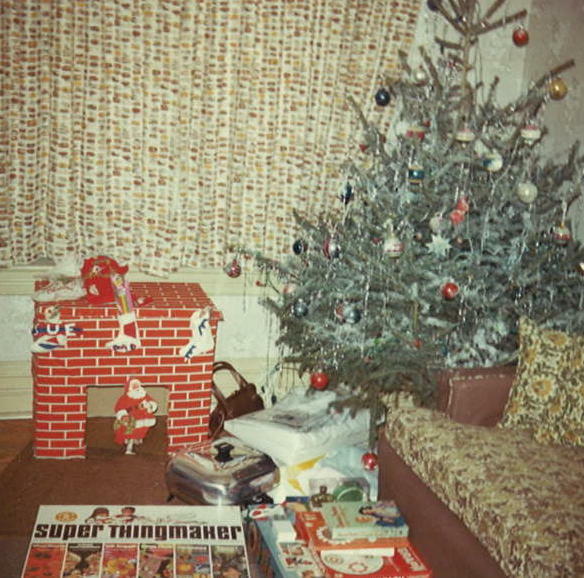 I'm always happy to see Christmas disappear into a wake of expensive memories. It was so much easier being a kid at Christmas time. That was pure magic. And every child should have wonderful Christmas memories. 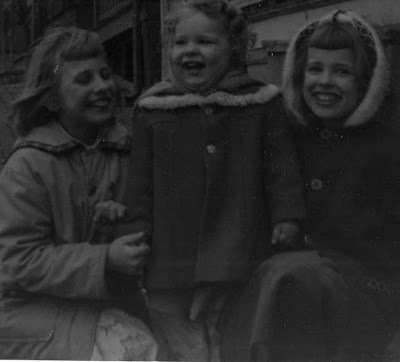 This very humble photo is of me in the middle with my sisters Paula on the left and Michelle on the right taken at Christmas time (no snow that year). As kids we had no idea then that "Santa" bought our gifts on credit and it took a whole year to pay them back. Skip to a Christmas 9 years later. 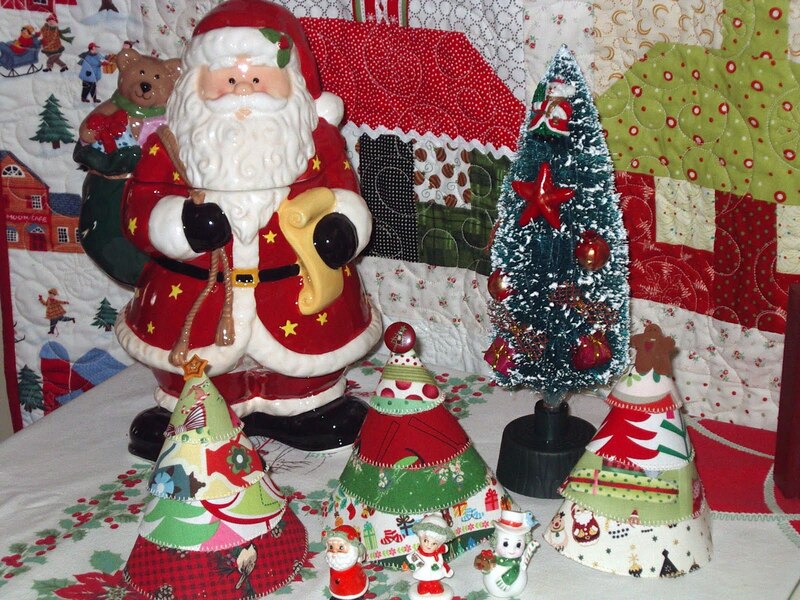 This Christmas is a nicer home with furniture recovered by Freda and home made drapes too. No fireplace in that house so we improvised with a box and brick paper. You can see my very favorite gift my "SUPER THINGMAKER"! 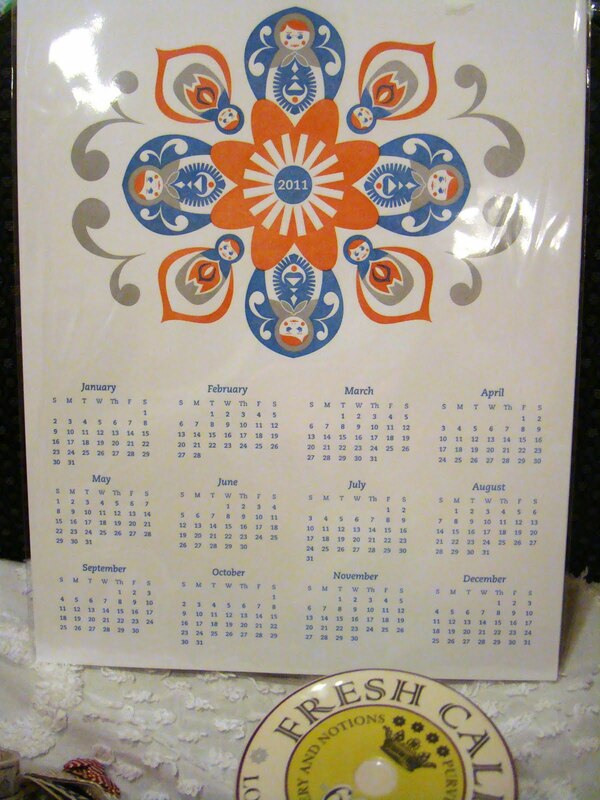 As well as Spirograph, books and other gifts. Mom (Freda) must have gotten an electric frying pan and a new purse that year, too. No more Christmas on credit. And here I am lounging on the couch. Santa brought new slippers and a new robe as well. This photo makes me feel somewhat 'Sally Draperish'. 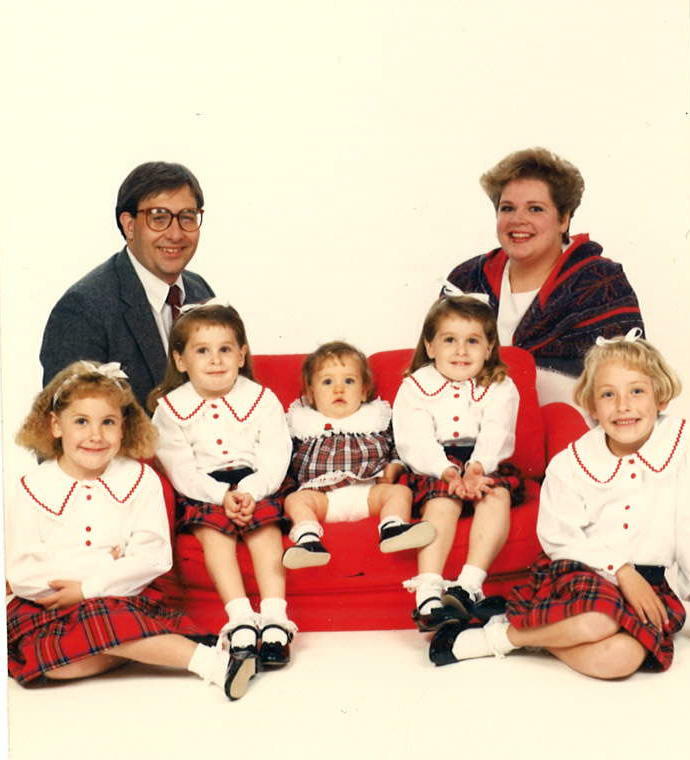 And now I'm married with 5 little girls. Heaven help that hair-do, it adds 20 years! Those were good old days. And more fast forward to the first Christmas in the house we live in now. 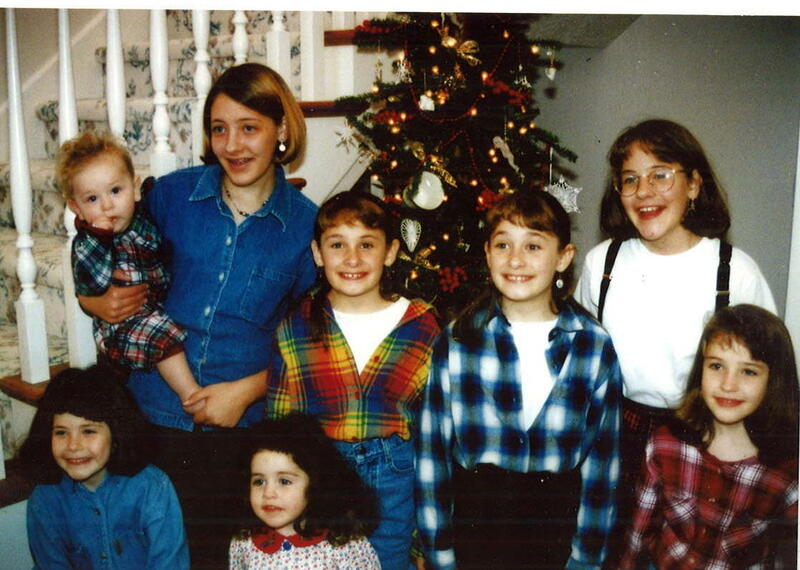 This was 1995. All 8 children are there. Looks like Laurie had self-cut bangs that year and flannel and denim shirts were in style. How I could get ready for Christmas 2 weeks in advance when my family was young... I don't know. 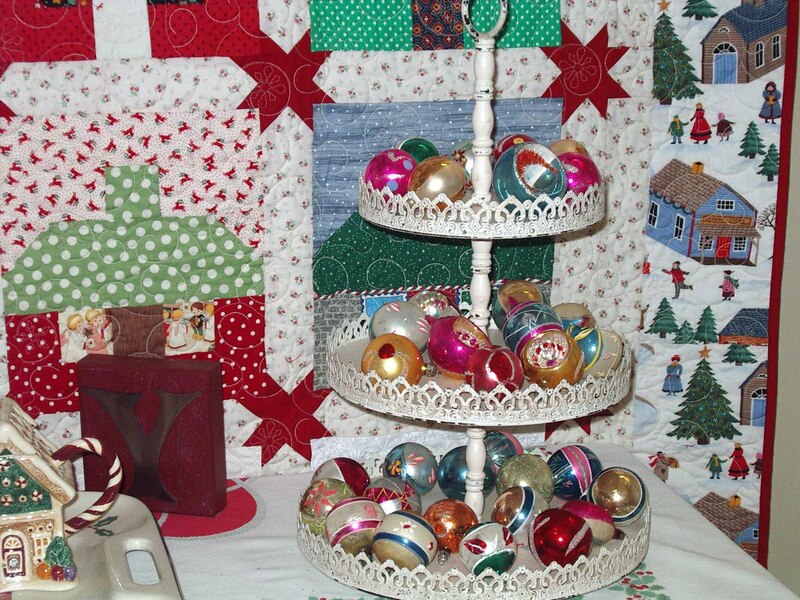 Now I'm sewing and cooking until nearly midnight on Christmas eve. I should have a photo of this Christmas 2010 but I can't believe we didn't line up and take one! Oh well. Too busy living it I guess. 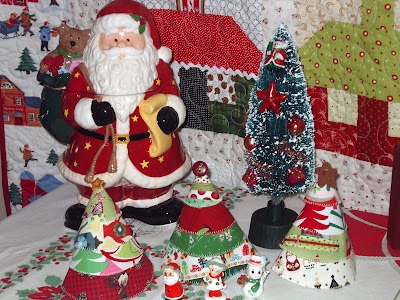 My decorations are put away today except the tree and my Christmas quilt. I love having everything up but I love having it all put away, too. Bring on the valentine decorations and 2011. 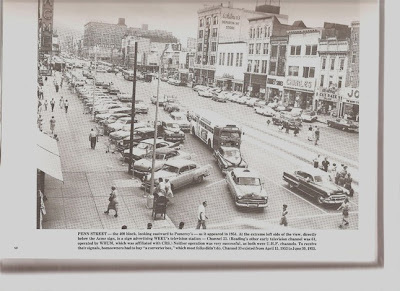 I grew up in Reading, Pennsylvania. 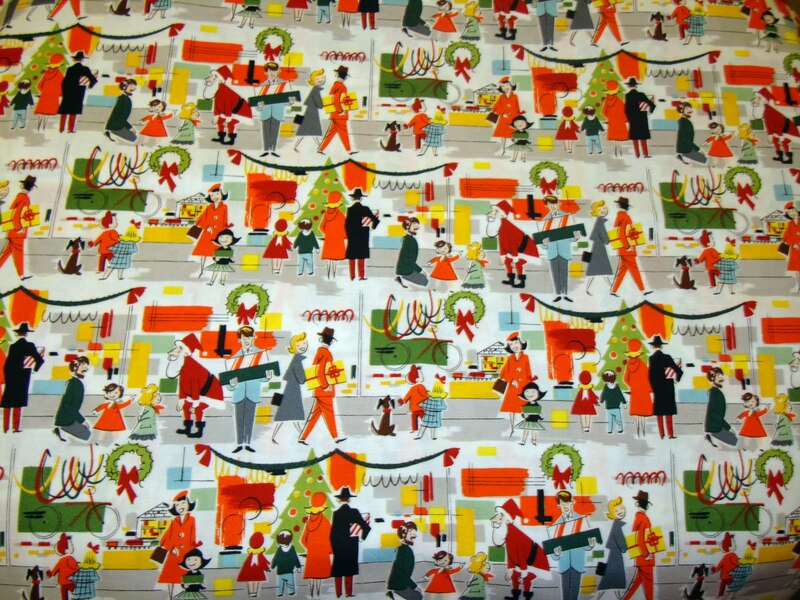 Each Christmas we would take the bus down to Penn St. and shop for Christmas at the department stores. Every Christmas I think of snowy streets, walking up and down Penn St. and all the store window displays. 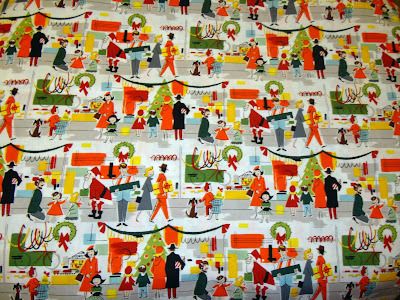 I was pretty excited to see this Alexander Henry fabric called "Merry Main Street". It captures that vintage feel of old fashioned store windows all dressed up for Christmas. 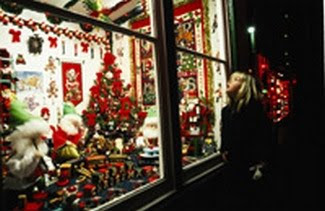 This isn't me in front of this store window but this photo captures how I felt watching the Christmas scenes in the window. There were 2 main department stores on Penn St. when I was growing up in the 60s. 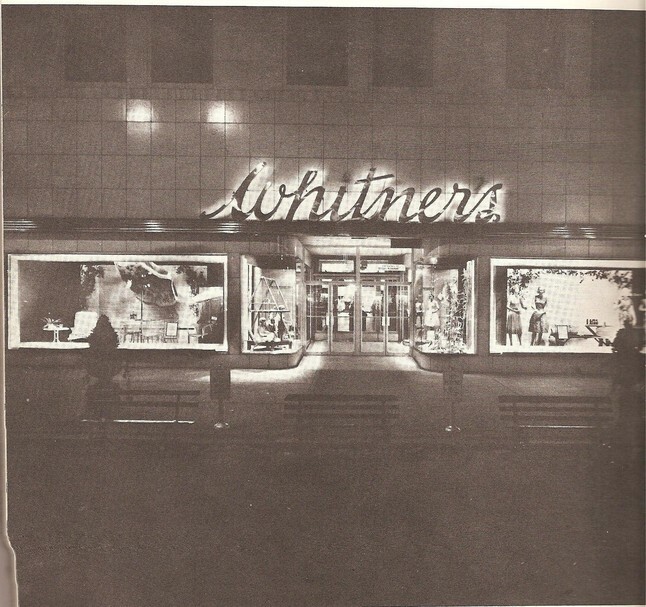 They are long gone now but one was Whitner's. 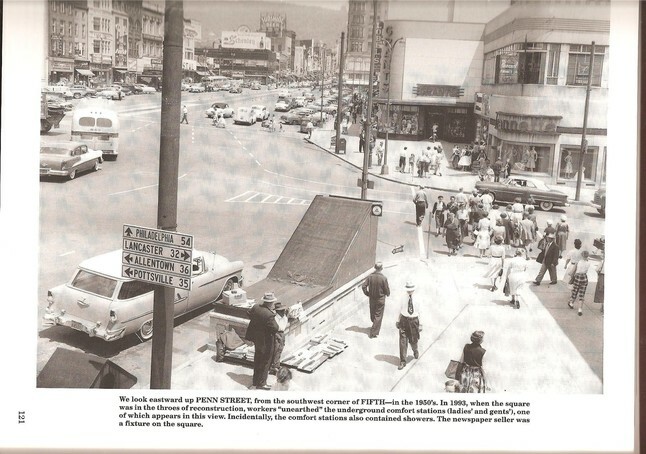 I found this photo on a web site talking about department stores that are gone now. This is a photo of what Penn St. looked like when I was a kid. Of course this wasn't taken in the winter, but oh how I remember walking up and down this street. 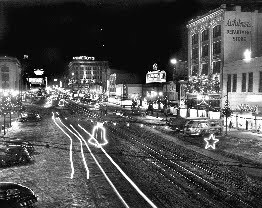 Here is another photo of Penn St probably in the 40s-50s. My dad was a city cop. I can just picture him walking down the street in his uniform. 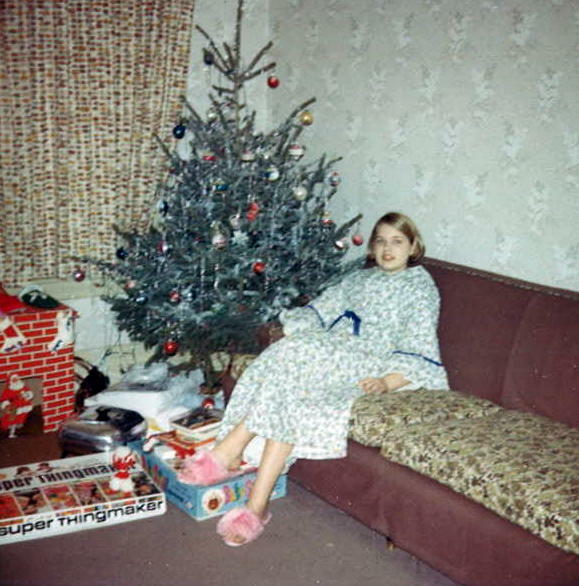 This photo is of Reading in the old days at Christmas. I was so happy to find these photos of times and scenes long gone. Pomeroy's was the other main store in town. 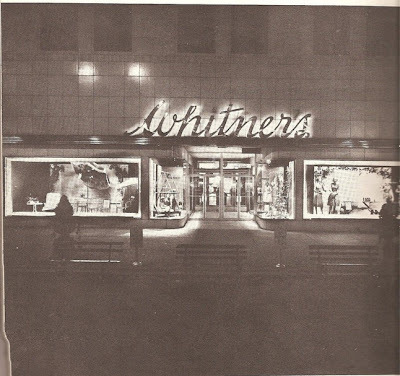 They had more store windows than Whitner's and that is really where the best window Christmas scenes were. On the 6th floor of Pomeroy's they would turn it into toyland and a little Christmas wonderland. 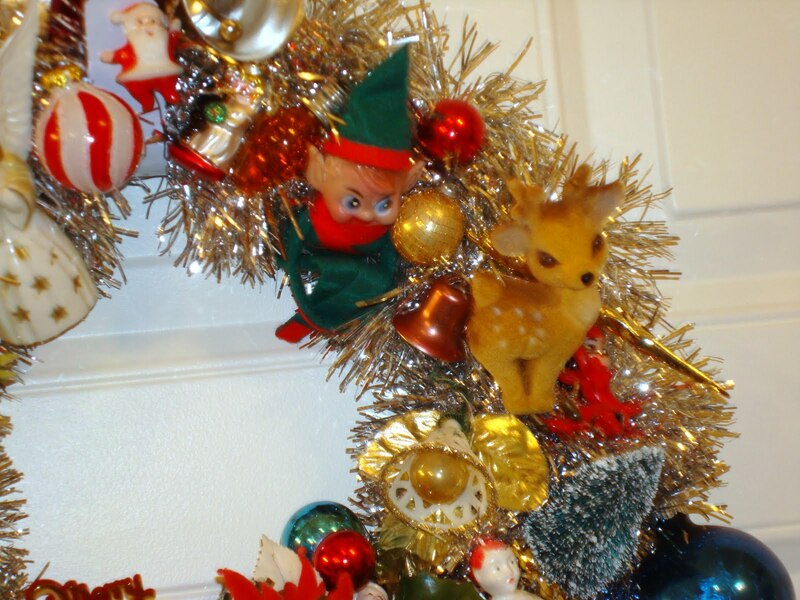 My mom, Freda, would take me there each year to sit on Santa's lap, look at the toys, and see the wonderful Christmas trees and decorations. I wish I could have put my finger on a photo of me with Santa but I need to look in several places and thought of it too late for this post. This Santa is from the 6th floor at Pomeroy's that someone recovered or bought when they tore the building down. Don't I wish I had some of this memorabilia. I do want to make something by next year from that Alexander Henry fabric, though. 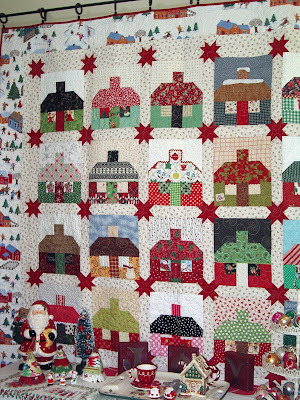 Seeing these old photos made me really want to make another Christmas quilt. I'm so grateful for the sweet childhood memories I have and for the sacrifices my parents made for me and my sisters. 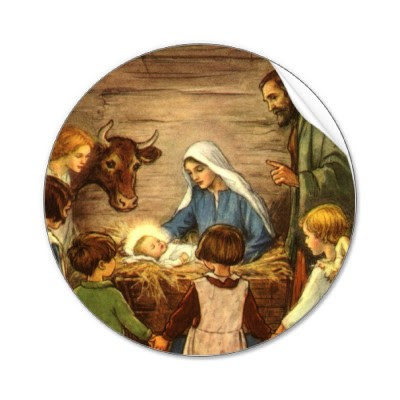 I'm also very grateful for my testimony of Jesus Christ and glad I have this opportunity to reflect on his birth. Merry Christmas to you all. I hope your holiday weekend is lovely and fun filled with you making good memories with your family or loved ones. 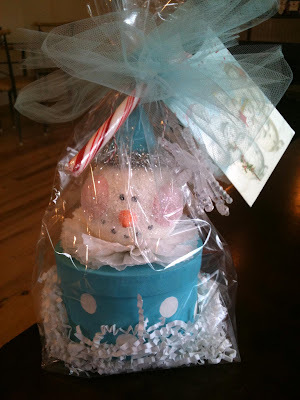 I really love Christmas surprises and I like to wait to open every gift until Christmas Eve or Christmas day. Sometimes it is hard to wait but I try to hold out because the anticipation is to be savored. When I was a girl I snooped and ruined all my Christmases so maybe that is why I love to wait now. However, I met Lori for a last minute BFF lunch on Saturday. (We were so busy talking we didn't even get to one of the main reasons we met up!) We did exchange special Christmas gifts and I wasn't going to open mine but Lori twisted my arm (ha). Lori is one of those unique people that are really and truly gifted. Her skills are so amazing. She never fails to shock with her talent. She made this amazing vintage snowman box. Every bit of it. I will treasure it for every Christmas to come. Look what is inside. It looks like Christmas candy - sweet and yummy. These are fat 6ths. And they are new to me. That is hard to do! Thank you so much Lori. 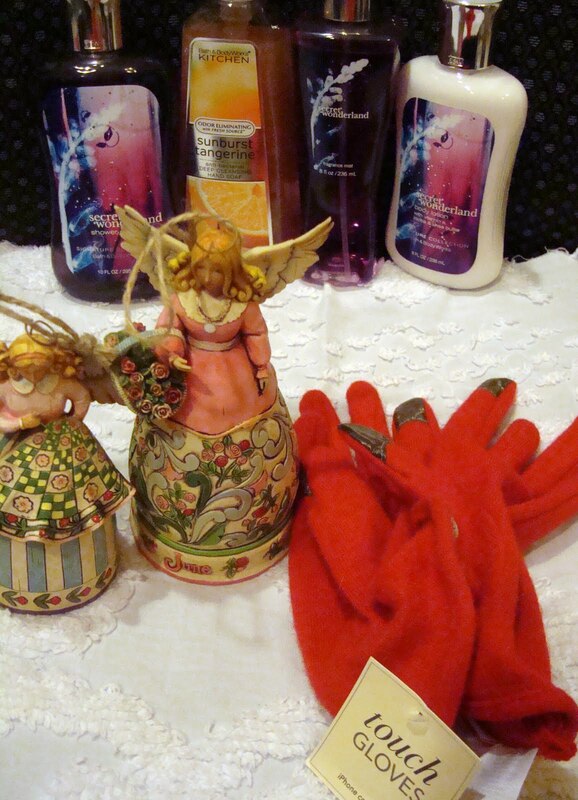 I put it in my entryway to shine with my Christmas treasures vintage and new. It fits in perfectly. Don't you just love it! Wish you could see it in person. Defined by Wikipedia: Kitsch (English pronunciation: /ˈkɪtʃ/, loanword from German) is a form of art that is considered an inferior, tasteless copy of an extant style of art or a worthless imitation of art of recognized value. 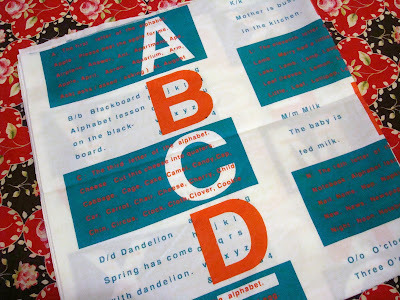 The concept is associated with the deliberate use of elements that may be thought of as cultural icons while making cheap mass-produced objects that are unoriginal. Kitsch also refers to the types of art that are aesthetically deficient (whether or not being sentimental, glamorous, theatrical, or creative) and that make creative gestures which merely imitate the superficial appearances of art through repeated conventions and formulae. Excessive sentimentality often is associated with the term. If you read my blog or remember I have been wanting a really kitschy vintage wreath for some time now. Last year at Christmas I saw one for sale but it was just too pricey so I passed it up but since then that wreath has been nagging at me. 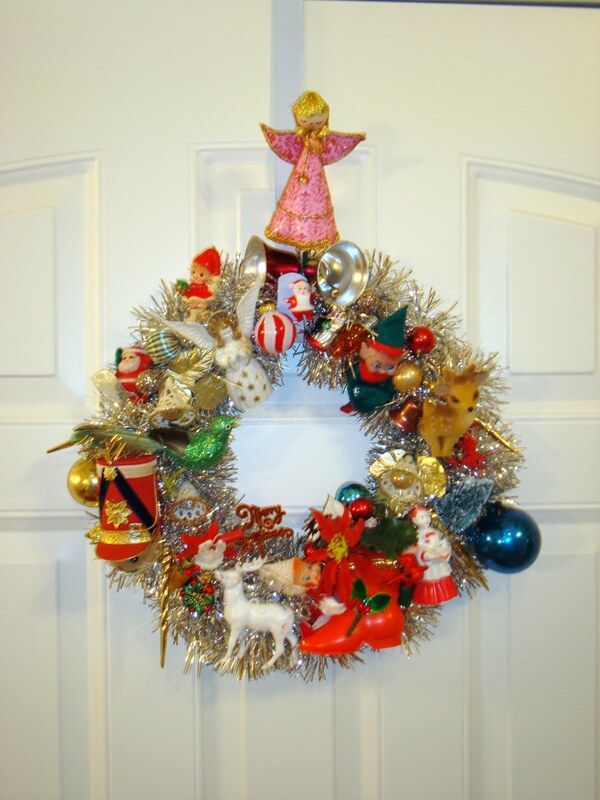 I hoped to find a vintage stuffed wreath this year but I gave up and decided to make my own. I've been picking up little bits here and there, mostly from etsy. Some came from Barbara at Oodles. 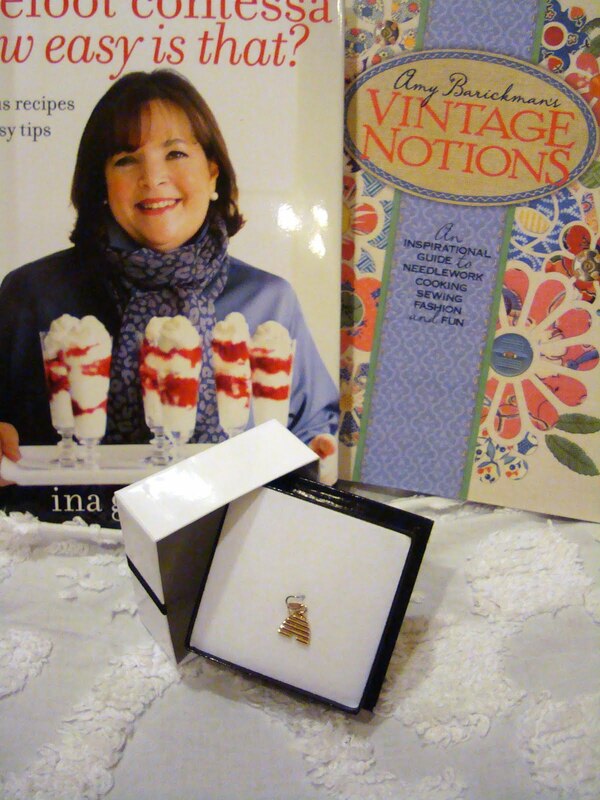 I get a lot of inspiration from Barbara and her vintage treasures. I love her blog. Over the weekend I finally finished my kitschy Christmas treasure wreath. Step back and admire above. If I say so myself, my wreath is way better than the wreath I saw for sale that I've been pining for. I absolutely love my wreath. 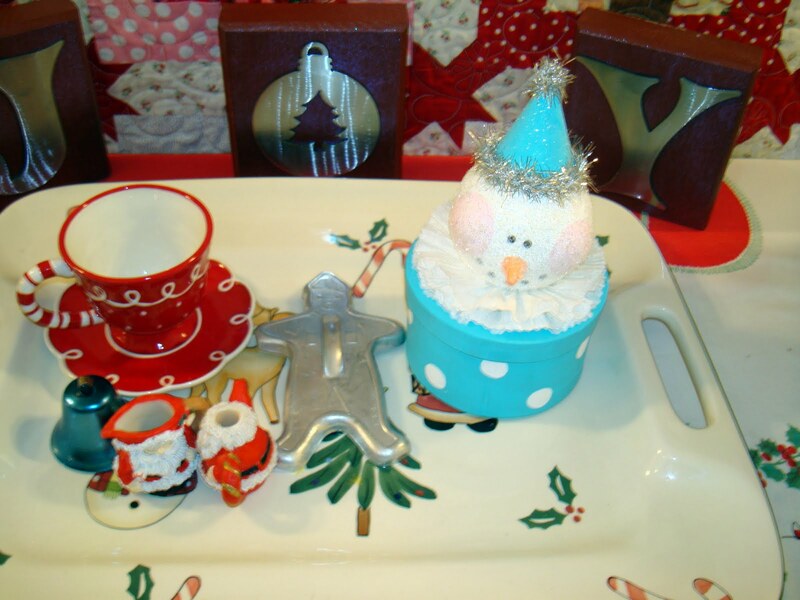 It reminds me of all the cheap Japanese treasures seen everywhere in the 60s and 70s at Christmastime. Seriously this is all stuff that would have been sold for pennies on the dollar at Miracle Mart when I was a kid. But today it is now vintage wonderfulness. 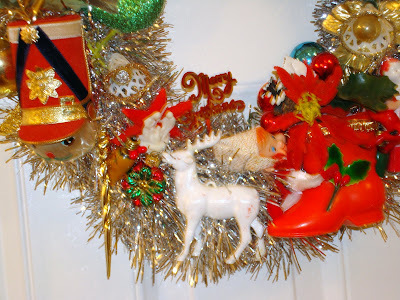 I used a 12" foam wreath and wrapped it with tinsel garland. 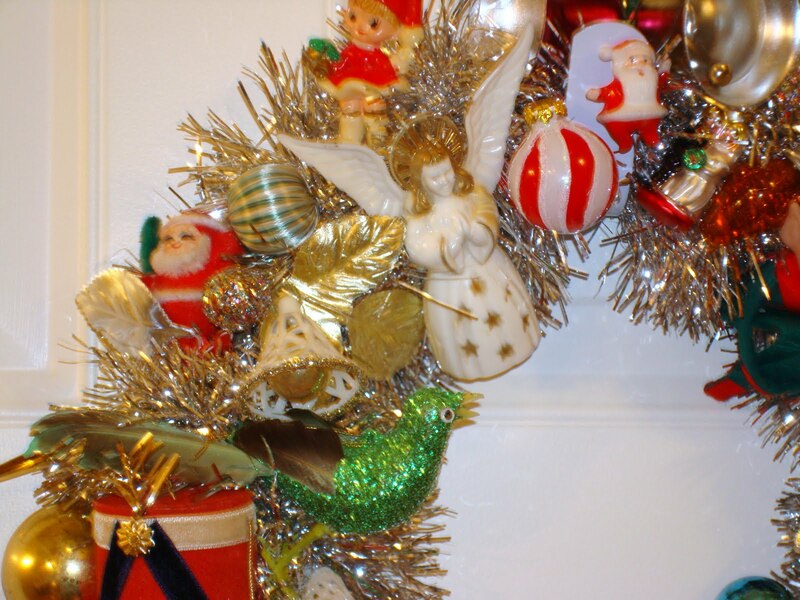 I miss overly tinseled trees from my childhood and the tinsel on the wreath serves as the prefect base. I glued on some of my biggest pieces with E6000 and then built the wreath around the bigger treasures adding things here and there until I filled the wreath to capacity. Sweet kitschiness. I think it is perfect. Instead of hanging it outside my front door I hung it inside my front door so I could admire it. One more look at my vintage Christmas ball collection. Also somewhat kitschy and over the top my 3 tiered display rack is full of colored glittery balls. P.S. Love our Eagles. Unbelievable win yesterday. To change the pace a bit I thought I would show you something fun and different today. Don't be too shocked, it is Kaffe fabric and wool. And I love them all. 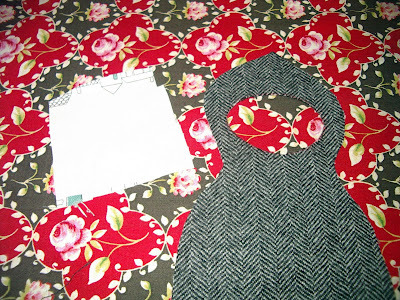 Last year Sandi sent me some wool pieces from her great collection. I had really not worked with wool before except for some embellishing here and there. So when I started working with the carolers I was able to pull a few from Sandi's share stash. Thanks again Sandi. I've really loved using wool. Belinda is another great friend. We have slightly different styles but similar senses of humor. She challenges me with her point of view. 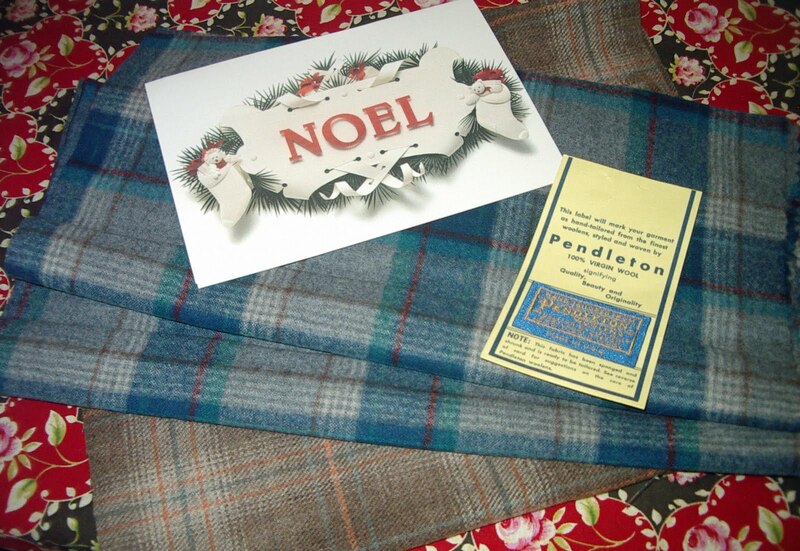 I was really surprised to see a package from my friend who has a great last name "Noel" - perfect for this time of year! Belinda sent me some Pendleton wool from her stash. I'm going to cut my last batch of carolers right away. It is really lovely. I'm always so stunned by the beauty of Kaffe quilts from Belinda and Nedra and other friends. 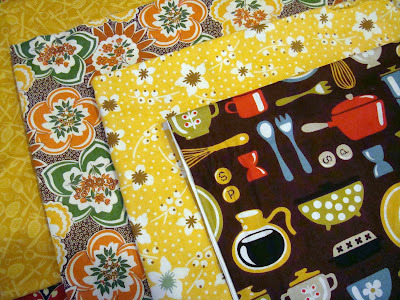 I have not made a Kaffe quilt yet but I told Belinda I want to make one in 2011. That is one of my New Year's Resolutions. So Belinda kindly shared some beautiful pieces from her stash to get me started. The color is just so amazing. I love the pieces. Thanks Belinda. 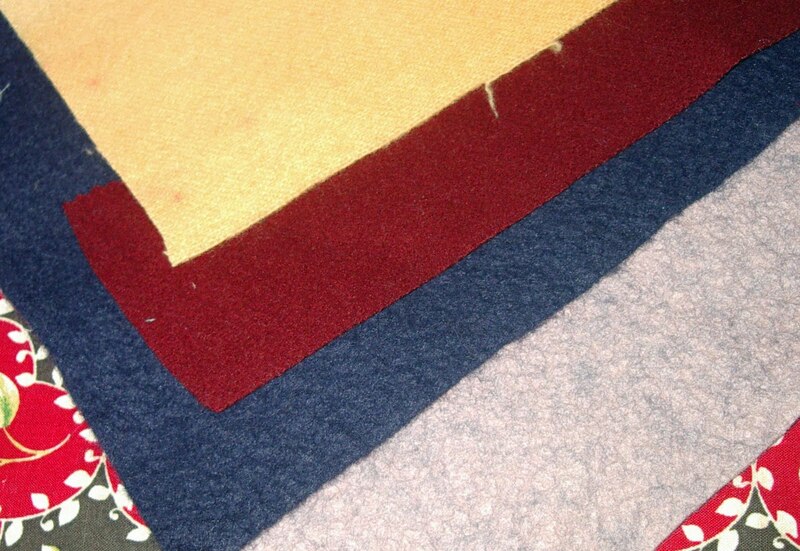 When we had our last Alpine Quilt meeting last month Janice remarked that in 100 years much of the fabric designed now won't really be classic or remembered. But Kaffe will stand the test of time and his fabric will be greatly admired as timeless. 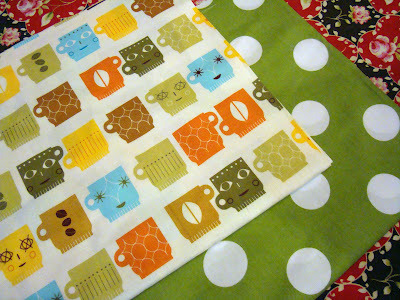 So I'm really excited to use these prints in my first Kaffe quilt. 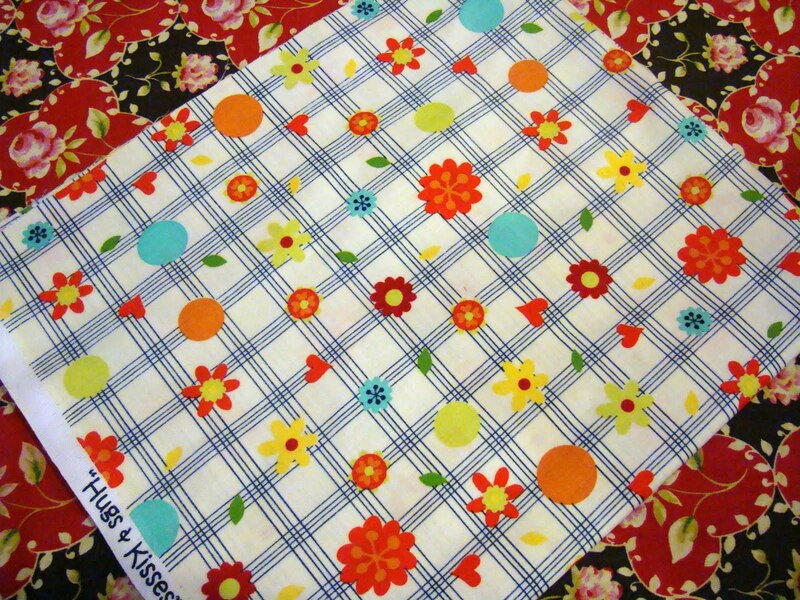 Belinda's advice was to ease in slowly and use a bit of my own fabric with the Kaffes. I see me using some plain fabric with these, which is another fabric type I want to use more of in 2011. Happy Weekend! Only 1 week left. I'm sure many of you have been seeing this very sweet tutorial around blogs and the Internet in the past week or so. 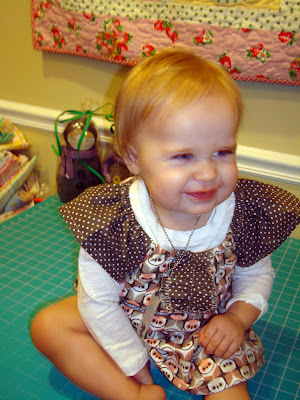 Gingercake Blog very generously shared her idea and pattern with all of us. You can find the pattern/tutorial here. 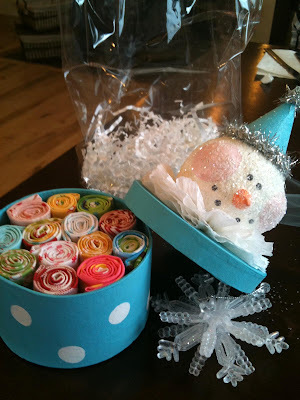 She actually has several really cute patterns and tutorials on her blog. I would suggest you bookmark her blog and return, she's fantastic. I thought I would show you what I've been doing with the Gingercake pattern. 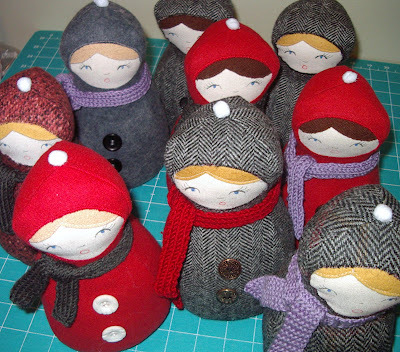 These are my carolers I've been making above. In addition to showing you my cuties I thought I'd share some tips I learned along the way. First of all I did not embroider the faces. I just simply am not that great with tiny tiny embroidery and my daughter Shelbie is pretty artistic so she drew the faces for me with very fine tip permanent markers. Each face is a little different and they are all full of personality. 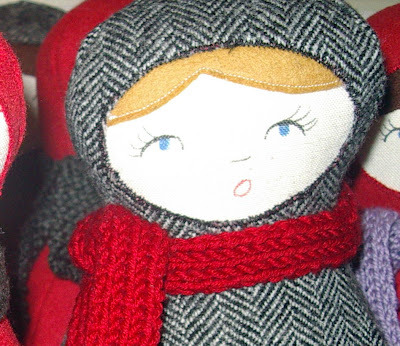 Shelbie also made me hand knitted scarves for my carolers. 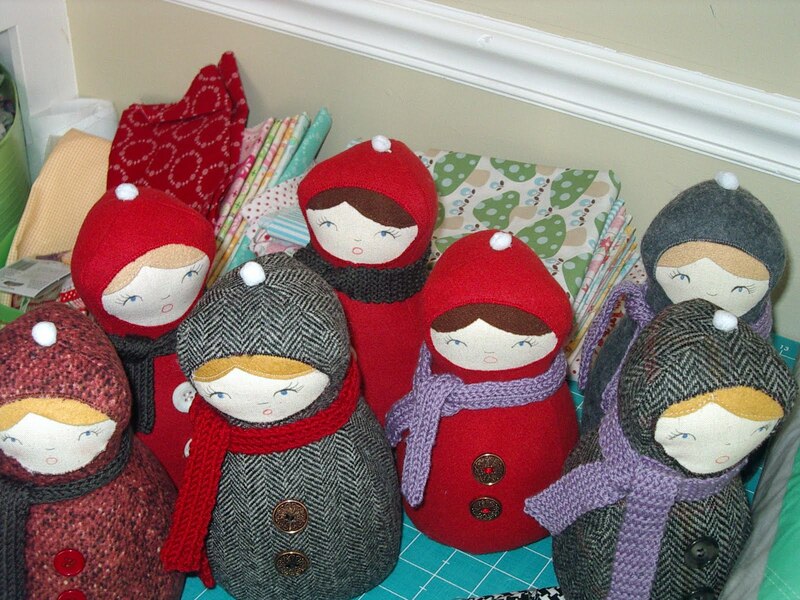 They are so so cute and finish off the caroler's coat so well. Thanks Shelbie. I used fiberfill to stuff the bodies and then some fine grit white clean sand that my friend Ashley had given to me after purchasing a 50 lb. bag at the hardware store. 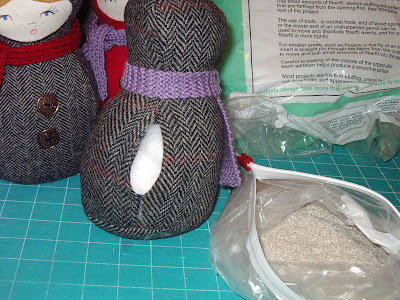 It worked perfectly by putting a cup of sand in the bottom to give the body of the carolers some weight. I will remind you when making a stuffed item, use a very tight/tiny stitch and be careful when stuffing. I did split a seam or two and had to throw a couple away after a learning disaster. I used butcher paper for my pattern and I actually ironed the pattern on my fabric so I could pick up the pattern piece while attached to the fabric and cut around with my nice sharp Ginghers. I know my photos are slightly backwards in the process. Sorry about that. 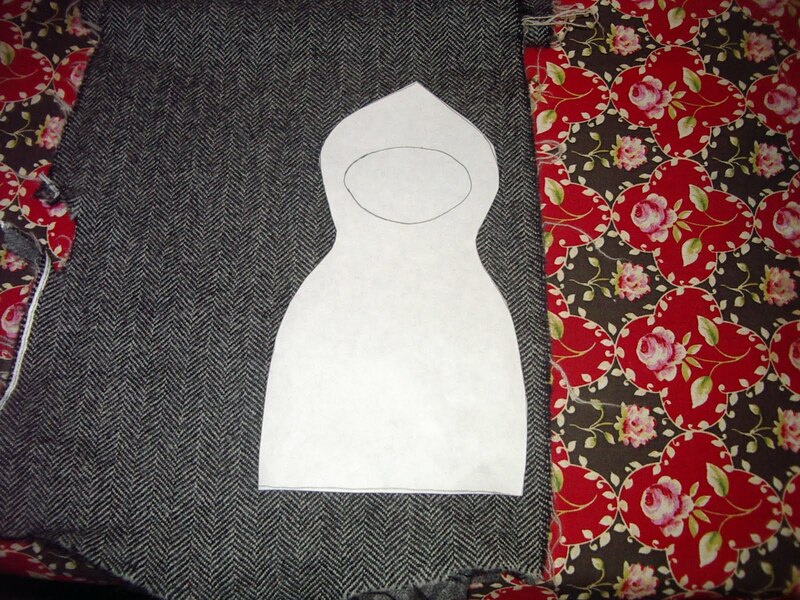 I used linen scraps for the face putting a square of linen under the opening and pinning in place while small zigzag stitching around the opening. I used E6000 to glue my pom poms on top of the little heads. I am not a fan of hot glue since I always burn myself. I didn't want to mess with trying to stitch a pom pom or trying to catch the string in the seam. 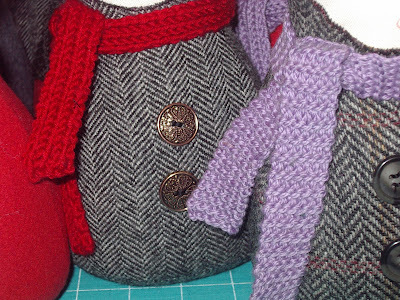 I used coat type buttons for the front that were slightly over sized compared with my caroler girls bodies. I also did stitch the wool hair down to the face. I felt it finished them off. 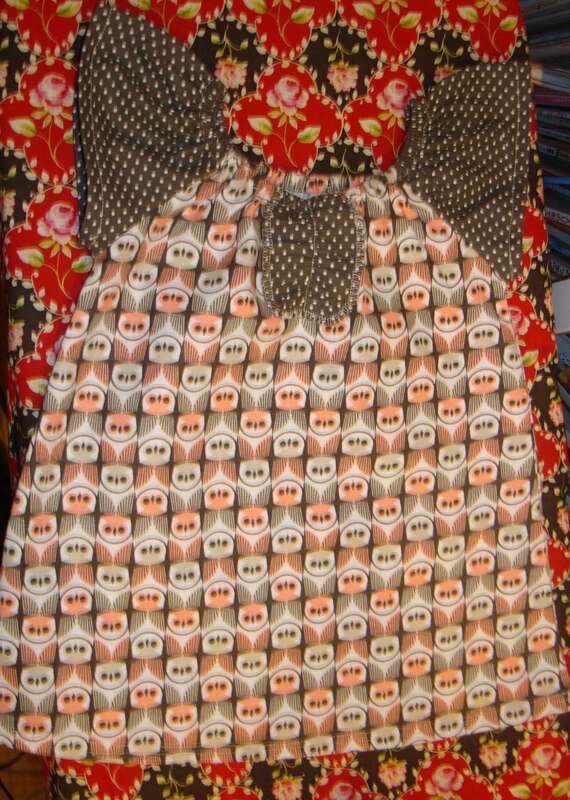 I made 9 of these so far and hope to make another 4 or so before the 25th and the bell rings on my sewing projects. I'm juggling about 3-4 projects in my sewing room right now. But aren't we all?! 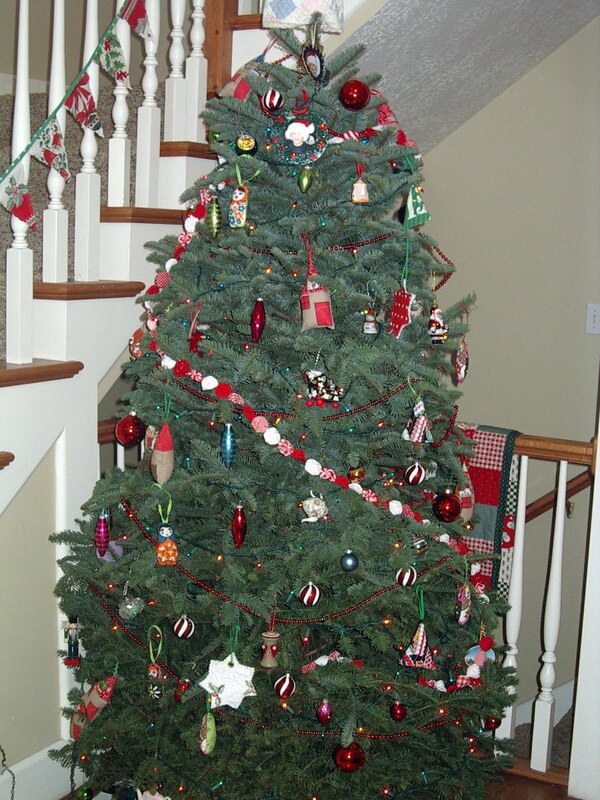 I really like to get my Christmas decorations out and my tree ready right after Thanksgiving. Especially since I'm the kind of person that wants every bit of Christmas taken down and life back to normal the day after Christmas. At our house boxing day really means getting out the boxes and putting Christmas away. ...until Jamie and Laurie went and picked out a tree and brought it home. Dave got the tree all situated in the entryway. And Mason helped me decorate. It is all done now and I am so happy about it. How could I have considered NOT having a Christmas Tree?? 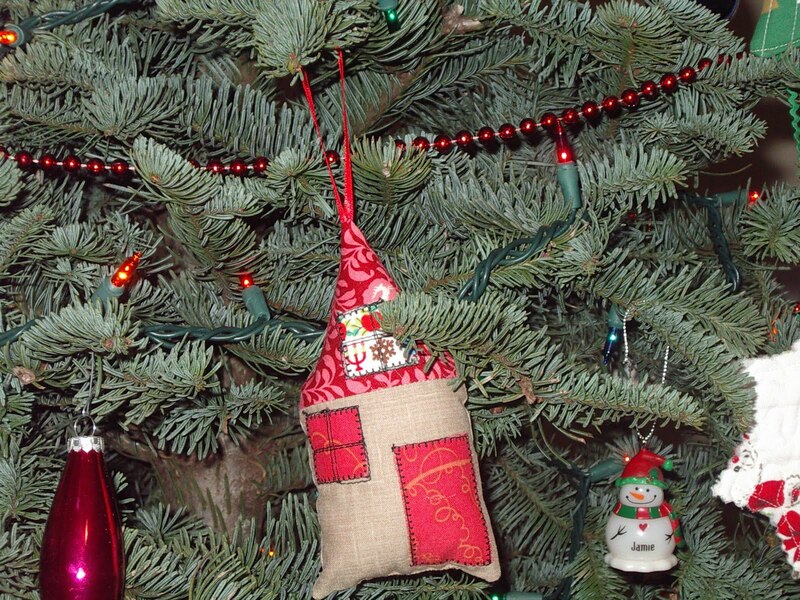 My favorite thing about the tree is my homemade ornaments. They just make me really happy and help me remember Christmas past with fun projects. 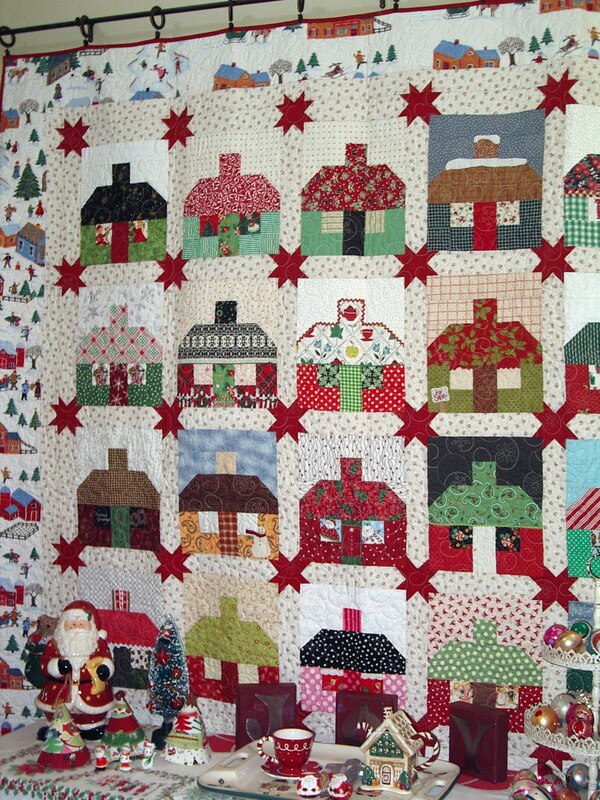 My Christmas Cottage quilt really makes me smile and I can't walk past it without stopping to admire and remember all the great friends I've made through blogging. Love seeing the blocks my friends made me. I really do adore this quilt. My friend Flora gave me the border print and it couldn't be more perfect. 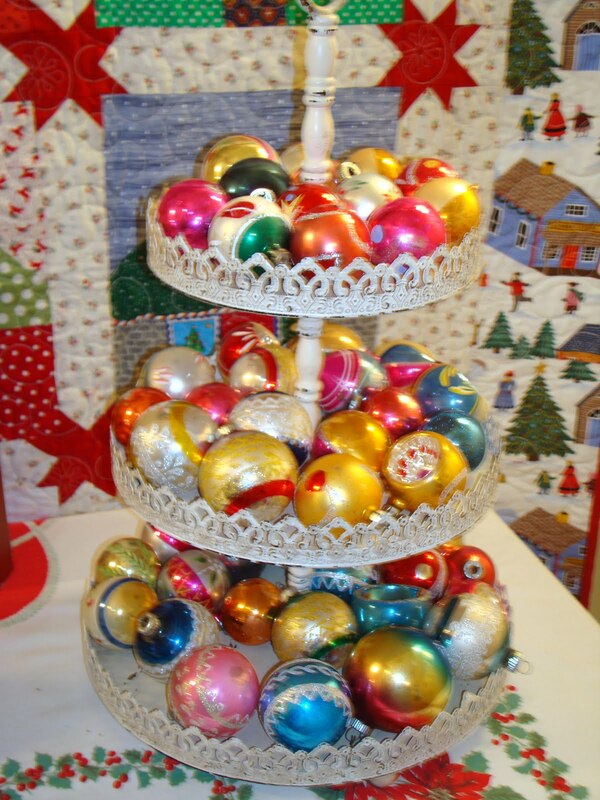 I decided to put my small collection of vintage Christmas balls on my little 3 tiered stand. Was it Belinda or Elaine that told me I should do that? Both gals are such encouraging friends. (or maybe it was someone else? )Whoever it was, thanks for suggesting that. They are perfect here. 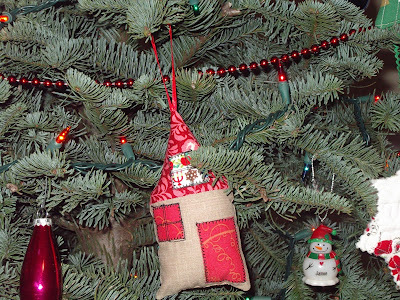 I like my little fabric houses, too. So many of you made those as well. Getting out these past Christmas projects to spread around really made my weekend. The house now smells and feels like Christmas is coming. 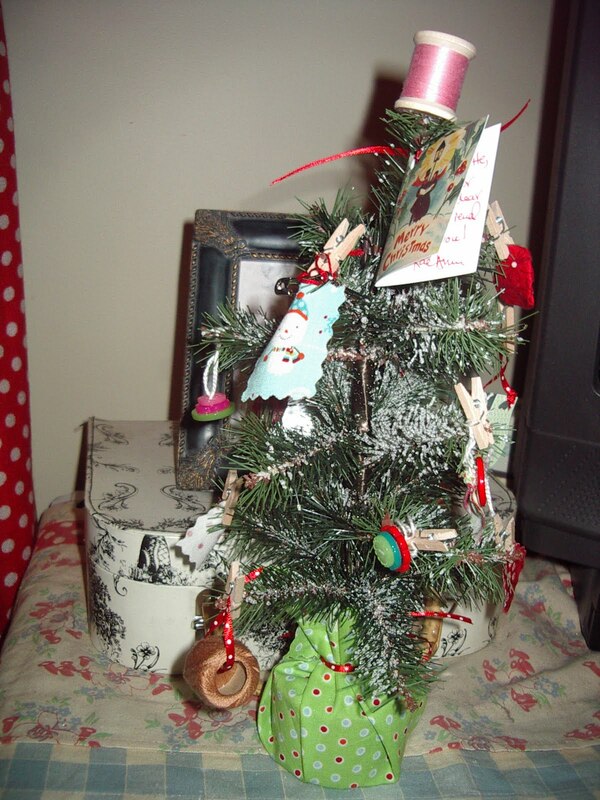 Here is my little tree from Rae Ann. I took it out of the stand so you could see how smartly she wrapped a fat quarter around the base. Everything on the tree is sewing themed. Isn't Rae Ann amazing. It is the most clever gift. I went to lunch with the girls the first of the month but I didn't want to open my gifts from them because I like to wait until Christmas. However, Rae Ann's gift had to be enjoyed. 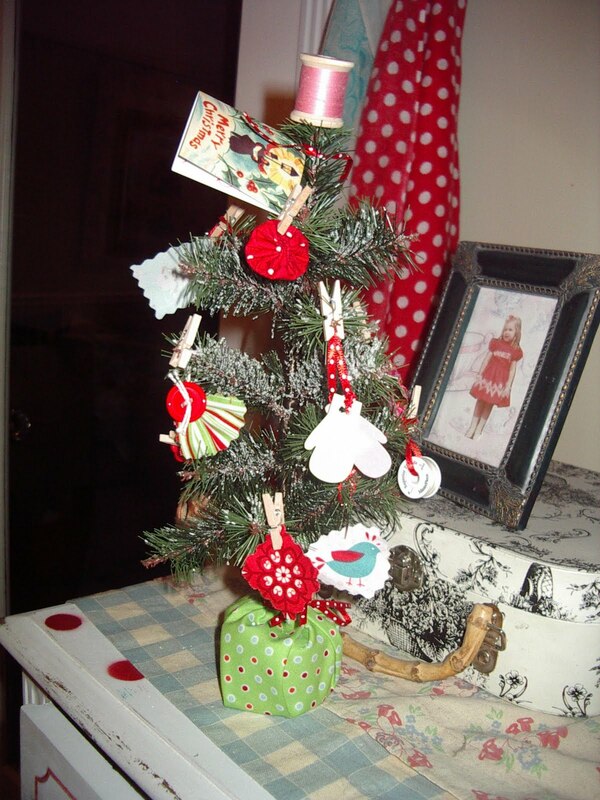 I have this tree in my sewing room so it can inspire me. Here is a sneak peek at what I've been working on. More on these darling carolers later this week. I'm finally enjoying my Christmas music instead of feeling guilty now since my house is ready for Christmas. (I'm not but the house is and that is at least a start). 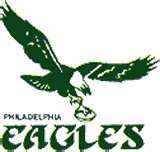 PS: Eagles won last night against Dallas. Yayy.